Farey manual traps have been around for a long time. Nowadays many have been left unused in garages, sheds and far away corners.Converting the Farey manual trap is to bring life back into the a machine whereby you will use less effort to load and fire traps because of a newly incorporated button, foot pedal or radio release. It throws a consistent 80 m, angles from +10 to +50 degrees. Farey 75 - conversion is avallable in standard or standard and midi clay models. Portable. Quality motorgear unit and clutch for 3/4 cocking ensures smooth operation and long life. 50 metre cable with button release. 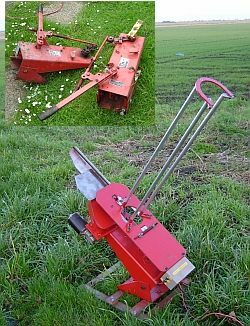 All type of clay pigeon traps repaired , update or modified. A trap maintenance program for Shooting Clubs and shooting grounds. Clay pigeon traps spare parts and springs made to customer specification.